The Big Book of Bloodlines, a new supplement for the Pathfinder Roleplaying Game by Interjection Games. Disclaimer: I am not affiliated with Bradley Crouch or Interjection Games. I did ask the publisher if I could plug for his kickstarter on this forum (since he doesn't have much of a forum presence outside of the Paizo forums), and he told me I could. Interjection Games has a large collection of Pathfinder RPG compatible supplements, mostly rules-heavy PDFs. They also ran a successful kickstarter last fall for a tome-of-magic-like (for which backers, myself included, already have the PDFs, and are only waiting for the hard copies). Hence, I am confident that if this project is funded, backers (including me) will be getting our money's worth. 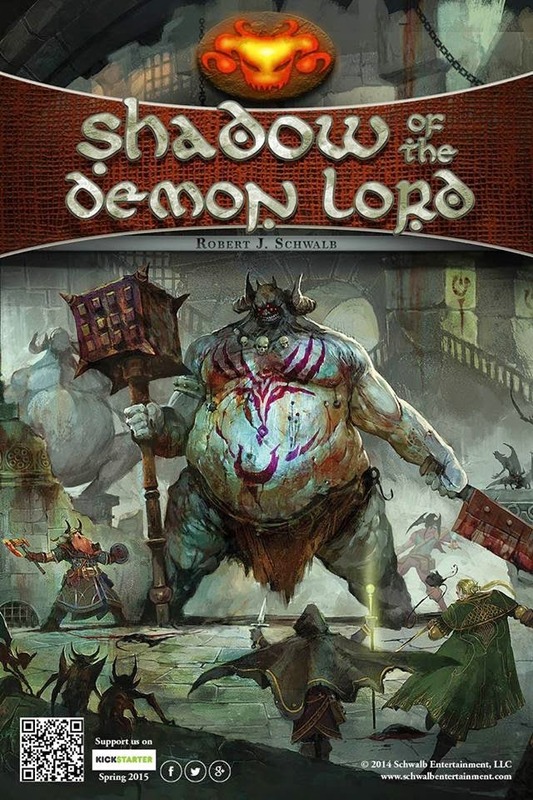 Robert J. Schwalb has started the Kickstarter for his Shadow of the Demon Lord RPG. The Kickstarter campaign has funded ($30,000) in less than a day and the first stretch goals have been revealed. The game takes place in a world standing on the brink of the apocalypse. What is the cause? Who is responsible? The Demon Lord, of course! This being of staggering power and boundless evil authors the catastrophes blighting the landscape. Each new horror released reflects the Demon Lord's approach, the touch of its shadow, and its growing hunger for not only the planet but the entirety of all things. Although near, the Demon Lord remains outside the cosmos, rattling the cage of its prison as it strains to escape the Void to visit catastrophic destruction to your world. The game system helps you tell interesting and exciting stories. To make this happen, the game system is easy to learn, plays fast, and requires little preparation to play. All these ensure both novice and veteran players can enjoy the game together. I've been a playtester since the beginning and I've seen the game evolve and mature into the game it is now. We've been playtesting it for over a year now and the games mechanics are tight and fast. One of the comments I heard most about the game when I ran demos at GMX last October was how easy it was to pick and play and how the games mechanics didn't get in the way of actually playing the game. Rob's experience in the gaming industry speaks for himself. He's worked on the 3rd, 4th and 5th editions of Dungeons & Dragons, both as a freelancer and as lead designer. He's won Ennies for his design work from the Warhammer Fantasy Roleplay game and Black Company campaign setting to the Song of Ice and Fire Roleplaying game. The funding goal gets us a 128-page, full-color softcover rulebook. This might seem slim, especially since I have over three times the number in pages of fun and terrifying content just waiting to be released into the wild. This said, the offered page count gives me enough room to include everything you need to play and run the game. Here’s the thing, though. The more stretch goals we hit, the bigger and saucier the book becomes. We all like saucy. Thought some folks here might find this of interest. We funded this kickstarter campaign in less than 24 hours, and in the next two days blew through three stretch goals. It's going to be a gorgeous full-color hardcover now. 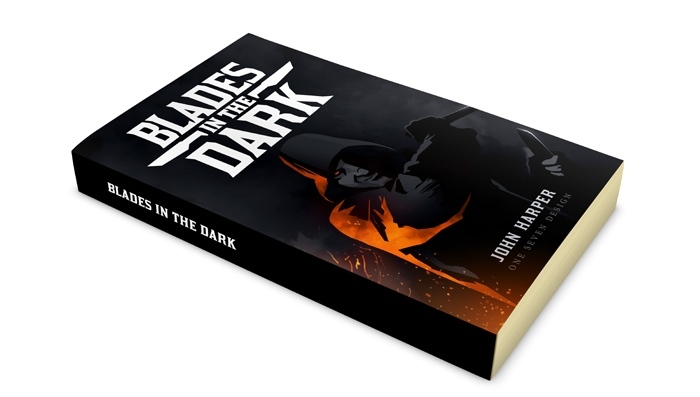 I am more excited about Blades in the Dark than I have been about any RPG kickstarter since Feng Shui 2. It looks pretty amazing; stretch goals have been dropping left and right, and more intriguing settings keep popping up. Mechanically, it shows its heritage as Apocalypse Engine, but it's an interesting change and refinement of the concept. The base game is about a crew of criminals trying to rise through the ranks in a series of heists, escapades, thefts, and other dirty deeds. There's reskins unlocked to turn it into Shadowrun, a super-villains game, Space Opera Scum & Villainy, pirates ... it's crazy. Really; check it out. I cancelled all my other pledges to other kickstarters and threw into the hardback tier, here. It looks that awesome. And best of all - you can download it when you pledge. And cancel your pledge if you hate it. I didn't; I am pretty enthralled and I can't wait to run my players through it. Oh man, wow. I don't know if I'll get the $50 in the next two weeks, though. Ahahaha... I get excited about stuff and I have to share. If you play tabletop games, then you might like modular mats that completely fill any size or shape table, work with any kind of marker, and are super durable. It's pretty simple and to the point, the way we think gaming stuff should be. We're starting our Kickstarter campaign on Saturday at 1 am EST (Friday midnight CST). If you like it, make sure to comment! Or if you have questions, let us know. We'd be happy to answer! Less than three days left! So far we've gotten a new bloodline-oriented base class and two archetypes for that base class added to the Big Book of Bloodlines for Pathfinder RPG. Additional archetypes will be added at $2400 and $2800. These look quite nice. I think I'm in for $30. I do wish I'd gotten to see more video of the square-gridded ones, though. I'm gonna regret finding this thread. Hey Obryn, did that game of yours come with a preview? I'm not sure I can do a hardcover level, but I'm interested in general. My dislike of digital is conflicting wih my general, you know, current level of poor. It does! Even at the $1 level, you can grab the sample rules from Update... 16? Then if you love it or hate it, you can decide from there. I don't back games anymore that aren't fairly well along their way, and that don't provide their rules. Saves a lot of heartache, lemme tell you. That got my attention. I'm a big Steven Brust fan. That said, I much prefer physical copies of my RPGs than digital copies. As in, I won't even bother if I'm not getting a book out of it. I see that the $20 tier offers print-on-demand physical softcover (priced about $10 above that after shipping, I'm sure) and there is a $50 hardcover tier. Is there any indication of if the stretch goals will be included in those books, or if they will be digital only? 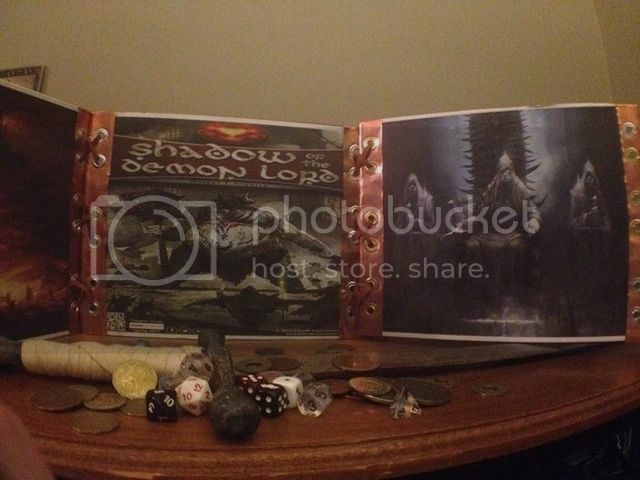 Shadow of the Demon Lord closes on Saturday, April 11th and we're close to $100,000! The book is already a 192 full-color hardback, hitting 100k bumps up the book to 256 pages. There's been plenty of adventures and setting pdfs unlocked, such as the Alfheim, Hell and Cults of the Demon Lord pdfs. A new limited backer level was added this morning and it's been filled (Hidden Cultist); 30 hand-crafted Deluxe Shadow Lord GM Screens, made by yours truly. While those slots are gone, pledging to the campaign will get you updates the quickest if more Deluxe GM Screens are added. Hmm. Obryn, I'm $20 in, how do I actually look at these QuickStart rules I'm supposed to have? I have been alerted of the latest stretch goal being met (blades of jhereg), and have received email saying the same, and that's it. Was hoping to look at the stuff today/tomorrow. I'd ask the guy. Kickstarters I've backed have gone both ways, but PDF-only for stretch goals is fairly common. It largely depends, I think, on who's authoring them. If it's the same author, it should go in the main book. If it's freelancers, you probably wouldn't want to hold up book production if they flake out on you. I'd guess PDF, since this would significantly inflate the page-count. e: And Brust is apparently not writing it directly, but overseeing the authorship of the guide and everything. Which is pretty darn awesome, still. I'm a big fan of the series, too, and I'd be kicking in if I weren't already. There's been a few! They are in the updates. Last edited by obryn; 2015-04-07 at 02:08 PM. I really need to do this on my computer, but it won't be set up again for a few days. Darn moving! Cool, thanks man. You are again, a saint. Glad to help! And yeah, moving. Blech. Now I am at home I have had a chance to do some searching and I think your kickstarter is this one: https://www.kickstarter.com/projects...elvish-scripts. Oathsworn Burrows and Badgers miniature line with skirmish rules. These are some seriously awesome anthro minis from one of the best companies I have ever bought from. Last edited by prophetic_joe; 2015-04-08 at 03:40 PM. I've backed their Kickstarter before. They do indeed make high quality miniatures. So I just upped my pledge to get a physical book, but I also recently moved and cannot find anywhere on Kickstarter to change my address. It's been a minute, do they send like, an email asking for a mailing address? Or am I missing a tab somewhere? There will be a survey sent out by the project creator when they are nearing completion; you'll tell him mailing information then. Have no worries! If you change your address after that survey, you'll need to send the creator a KS message unless they're using something like BackerKit. Man, I can't for this, btw. Last edited by obryn; 2015-04-09 at 11:02 PM. Aye, I'm a little sad I have to wait to November even for the PdFs, but it really is an exciting look at a lot of things, wrapped up in pretty much exactly everything my tabletop was lacking. If I had more rules available i would probably start a play by post to test it. We're happy to announce the Kickstarter for our flagship game Blood and Bone. Blood and Bone is a gritty, realistic, low fantasy system and combined campaign setting. As a GM, I know how frustrating it can be to run an encounter without the help of visual aids. Beads, dice, and other such items can be used represent an NPC or creature, but they take you completely out of the story. With the high price of pewter and even plastic figurines, I needed an inexpensive alternative. The tokens I have created are a standard one inch in diameter, and can be used with grids or hexagons. They have a felt base, so they move smoothly and are safe for any gaming surface. Each token is also covered with epoxy resin for protection. The core is made of zinc-plated steel, for weight and balance. The finished tokens will be printed on professional-grade photo paper for a bright, long lasting image. This could really benefit from more pictures of what you're intending, and maybe a quick diagram of their construction. Thanks for the feedback. I'll get to making the diagram, and as soon as I get different types made, I'll post those as well. With „The Games Collective“ young RPG design team I am part of, I'm turning to Kickstarter to seek funding for our new game, Awaken. Fans of dark fantasy games, creativity and story driven experiences, will feel at home in Awaken, a pen and paper RPG heavily influenced by Slavic and Mediterranean folklore. The Kickstarter campaign will feature the core game at $55, and will be shipped worldwide. The logistics and publishing of the Awaken is supported by Studio 2 Publishing, the sales, warehousing, and publishing partner of many game companies, including Pinnacle Entertainment, Exile Game Studio, Crafty Games, Engine Publishing, Hunters Books, Paradigm Concepts, and many more. Step into a land ravaged by war against a nightmarish adversary, governed by the loose Alliance of the Great Cities. The decimated remains of mankind struggle to rebuild their cities—led by the fabled Vasalli, leaders and paragons of society—while the noble lords indulge in intrigues and power plays. But with the colossal guardians dying out, the re-emergence of the dreadful Vargans, and the incursions of the mysterious nations from the North, the citizens of the Alliance are slowly coming to understand that their struggles are just beginning. Feel free to post comments, questions, suggestions etc. Last edited by Draxus; 2015-04-21 at 02:50 AM.